How do you teach yourself piano and stay motivated? Read more on how to stay motivated, and get some tips to keep you inspired! So, if you have chosen to learn piano by yourself, how do you keep yourself and stay motivated? After the first weeks (days, months...) of your "honey moon" with your instrument, obligations and life's essentials pile up. First of all, you can choose to accept that you can only work in periods. Some people just naturally work better in intensive periods, and that's OK.
Just make sure to "schedule" your next time of intensive playing- and be patient with yourself if it is a bit "rusty" to get started again. You'll soon be back on track how to learn piano. New habits take a while to form. See if you can make your practice sessions learning piano as pleasurable as possible- it is far easier to start a new habit with something we associate with pleasant things. A helpful method for adults teaching themselves piano is: Alfred's Self-Teaching Adult Piano Course: The new, easy and fun way to teach yourself to play. Here are 10 important piano playing tips and advice to help you stay on track. 1. First of all, schedule a regular time for yourself when you can be undisturbed. 2. Make your "piano corner" a cozy place. Have a really comfortable piano bench at the correct height, perfect lighting, a CD player, maybe computer or laptop, pencils, metronome, music books and piano sheet music, and books - all within reach. So, simple things count- your place for learning piano should be inviting and functional, inspiring and relaxing! 4. 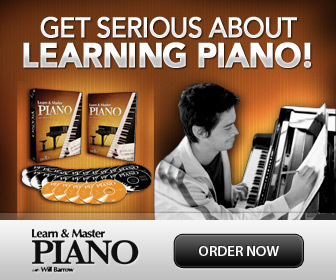 The time you spend how to learn piano is entirely up to you. Just spend it! Even if you don’t feel like playing, stick to the plan and lean back in a comfortable chair and listen to some great (piano) music, to inspire you- or read about composers, famous piano performers or styles of music that interest you. You could also learn more about piano history and music theory. 5. Make the time you spend in your "music corner" your own special time. Make the time you spend to teach yourself piano cozy, inspiring, relaxing and fun and you are already motivated! Watch DVD's with or about your favorite pianists or composers, go to concerts-indulge! You'll get inspired and keep your own creative "juices" flowing! 6. Set goals! I keep a journal with pieces I intend to play. When I practice, I think about how much I would like to learn that day. Afterward I jot down a note or two about how it went, and what I would like to remember for next time. This way, even if I will not be able to practice for a while- I can start exactly where I left last time. It is also fun to actually see the progress I make. 7. Record yourself! Once you have reached a goal, learned a piece or even made your own, record it! You can also video film yourself! Depending on your skill at the computer, you can make mp3 files, and compile them into your very own CD. Every year each of my students get a CD with their own performance of the pieces that they have studied during the year. The CD is a perfect gift for relatives of course, but also motivation and a measure of progress. We have a dear friend, a retired University professor, who every year creates a CD with his own compositions. This is a hobby of his and with a synthesizer, some recording equipment and computer; he creates his music and sends as a gift to his friends. What a wonderful idea! 8. Start a blog! Share your piano learning adventures with friends and family! I have seen several charming blogs by instrumental hobbyists, sharing their trials and successes and above all, love for their instrument with the world. Great motivator! 9. Once you have a little repertoire going-invite friends and family and have a very informal home concert! Instead of the regular dinner, serve snacks and drinks and share your music. Even better- play with friends! Pianists are always wanted for all kinds of ensembles and accompaniment! Or start a group yourself, there are many fun ways to play in an ensemble. 10. Above all- remember to have fun and enjoy yourself! Sure it takes discipline to teach yourself piano as anything new- but if we don’t have fun or enjoy it, there is no way we would stick to it! If you teach yourself piano, you can also get help and motivation from this online piano course that teaches you all the basics in many different styles.